Through most of the Cretaceous Period, the Eastern half of Utah was covered by an ocean.In the Moab area mainly shales were deposited, resulting in the famous, (infamous) gray, Mancos Shale. If anybody has ever been to Green River Utah, you know what I'm talking about. This area is a reflection of the conditions during this time, an ocean floor basically. In the earlier strata layers of the Cretaceous period one can find rocks replete with dinosaur fossils. (For a look at the dinosaurs living at this time see: http://geology.utah.gov/utahgeo/dinofossil/dinecret.htm). This layer is also know for it's uranium and vanadium deposits. 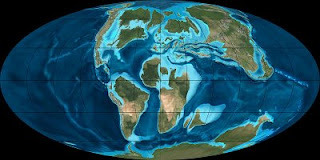 In the Late Cretaceous the ocean covering Eastern Utah began to recede as the Western part of the continent started to uplift. In the Arches area, as the salt dome of today's Salt Valley Anticline started to uplift, these layers were eroded away. The Cretaceous Period was one of high temperatures, accounting for the rise of the shallow oceans. Flowering plants like the magnolia also began to thrive. For a more in depth look at the climate and more info. on the subject see: http://en.wikipedia.org/wiki/Cretaceous#Climate. The Photo above is a depiction of how the Earth looked during the middle Cretaceous Period.